IS COMING TO SALT LAKE CITY, MARCH 7 – 11! You can get your FREE tickets to Disney On Ice by donating books on Monday January 23rd at the Energy Solutions Arena. Complete details HERE. Read all about Kylee Nielsen, a local Utahn that will be skating in Disney On ice. WHAT: Toy Story 3, the Academy Award®-winning smash hit blockbuster, is so hot it’s cool as everyone’s favorite toys take to the ice in Disney On Ice presents Disney•Pixar’s Toy Story 3! An accomplished creative team and a cast of world-class skaters are bringing Woody, the pull-string cowboy; space ranger Buzz Lightyear; Jessie, the yodeling cowgirl; and the rest of the Toy Story gang to fans and families in Salt Lake City with this all-new, high-energy ice spectacular. 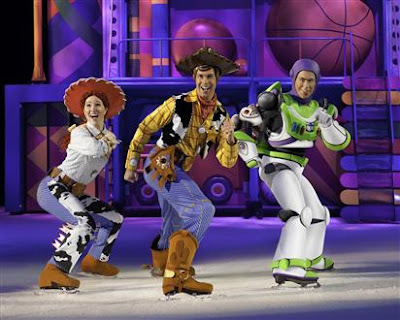 Inspired by the #1 animated movie of all time, Toy Story 3, and memorable moments from Toy Story and Toy Story 2, everyone’s favorite characters are hitting the ice in this sensational live production coming to your hometown! Catch all the heroic action when Buzz Lightyear, Woody, Jessie and the Toy Story gang escape from the rambunctious tots of Sunnyside Daycare and race for home, in their most daring adventure ever. Plus a few new faces join the fun, including Barbie’s groovy bachelor Ken and Lots-o’-Huggin’ Bear. It’s the biggest Toy Story experience ever on ice, jam-packed with fast-paced adventure such as Buzz’s galactic battle with Emperor Zurg and a hoe-down on the set of “Woody’s Roundup.” Relive the humor, friendship and charm of Toy Story when Disney On Ice presents Disney•Pixar’s Toy Story 3 takes family fun to infinity and beyond! Tickets are are available through the EnergySolutions Arena Box Office and all SmithTix locations, via phone by calling 801-355-SEAT or 800-888-TIXX and online at www.energysolutionsarena.com or www.smithstix.com.